Fifteen years ago, I'd get in the car and drive Corley Mill Road from one end to the other for the fun of it. Corley Mill was a two lane road with rolling hills through a forest made up of mostly hardwoods, a novelty in the pine belt. It was also reminiscent of the woods in my New England hometown, and made me nostalgic for the leaves that canopied the narrow road and the hills I missed from Massachusetts. It was my happy place after leaving my other hometown in the deep south, where my happy place was a swing at the waterfront on the Back Bay. Corley Mill is now the gateway to multiple subdivisions and a new high school, not even a shadow of its former self. A new swing hangs in homage to the one of my childhood on Paw Paw's property, which now belonging to my uncle. Time does its relentless work of change. And here I am a year from my declaration that I was boldly embracing gray. I don't know when or why I chose this arbitrary amount of time of one year to figure out my broader worldview, one that traded in black and white for all the hues of gray in between. I have done much to explore this expansive territory and it is changing me. I've worshipped in Anglican, Presbyterian, and Episcopal churches. I've read academic works from both camps on what the Bible teaches about women and have become somewhat of a feminist. I've discovered new-to-me approaches to scripture beyond systematic theology that have breathed new life into my relationship with the Bible I so love. I've had wine with family and friends. I've allowed myself to be seen and heard and have weight, even though it still feels like clunking around in my mother's red loafers when I was five. But I know its a good gift to give myself, so I keep trying and hoping I will grow into it. I've left the confines of legalistic, small boundaries for complex freedom in my walk with Christ. I bought a copy of The Book of Common Prayer to read and pray through beautiful words that Christians worldwide are reading/pondering/praying. It feels like another aspect of community, added to my personal relationship with Jesus. We'll be opening the door this Halloween and hurrah for the candy, the costumes, and the giddy children with tired moms and dads. What was I thinking all these years? I've added stillness, contemplation, and listening to my corporate worship repertoire of loud singing, clapping, and hand raising (the more demonstrative the better). I thought this would be an "after" post. But this isn't a bucket list as much as it is a way of living, another beautiful discovery this past year. It didn't turn out to be a process or project with deadlines. Even this is a shade of gray and not black and white. So instead of an "after" post, let this serve as a progress report. And long live the progress, I say. May we never stop folding gently into all the ways to live into the freedom of Christ. My faith is no longer flat and linear. It's nuanced and multidimensional. I've pressed on hollow platitudes and formulaic approaches with small, stingy boundaries. I didn't know they would crumple to reveal a wider world full of wonder and peril, and in need of God's love, generosity and freedom. My faith now incorporates doubt, questions, pain, fear and things I will never understand, all without taking away anything from God's worthiness of everything perfect. Because he's also deserving of my everything, including the sad, earthly-fallen parts that persist. He is the only one who knows what to do with these things, and ignoring them didn't make them go away. I don't think I realized how hard I tried to wear blinders to those unsettled, broken parts. I did it because I didn't think they served my witness or spoke well of God. How laughable to think that I could edit my faith to protect the reputation of a fearsome and untameable God. What if the opposite is what's true: that living in victory and faith alongside the hard, unreconciled things speaks the most eloquently about God's character? The commonality in all these things is that they are more generous and expansive than my former stances. It takes more mindfulness to be true to God's principles in each circumstance than it was to adhere to a set of succinct rules judiciously if not smugly laid atop every situation, one size fits all. But it's also abundant and deeply satisfying, tethers me closer to my Lord, and keeps me looking and listening for him. It's more like what he said he came to bring us. I serve a God whose every promise is yes and amen. Linking with Addie Zierman's "Let Go and Let God" conversation today. This is beautiful, Dawn! I'm jumping-out-of-my-skin excited for you! I've definitely had to laugh at myself in the past for expecting a tidy "after" in a story whose whole point is embracing grey. Thank you for sharing so bravely! Loving your journey and where it continues to take you! Hi, Todd. Thanks for your comment. I have thought of Rick so many times this past year and know he would have loved this journey too. I still would desperately love for him to know of this -- not that it matters to him anymore. But it does so much to me. Even still. Thanks for your comment, friend. This is really wonderful, Dawn! So glad to read about your journey into the grey and all you've done in this year. I especially liked this line: "How laughable to think that I could edit my faith to protect the reputation of a fearsome and untameable God." I've been wrestling with my faith for a couple of years now and you're right, it's a process, probably a lifelong one. We can't limit God to our own understanding, but letting him be with and for us is quite a liberating experience. Thank you so much for sharing, all the best as you continue your process and progress! Your neighbor at Addie's today. 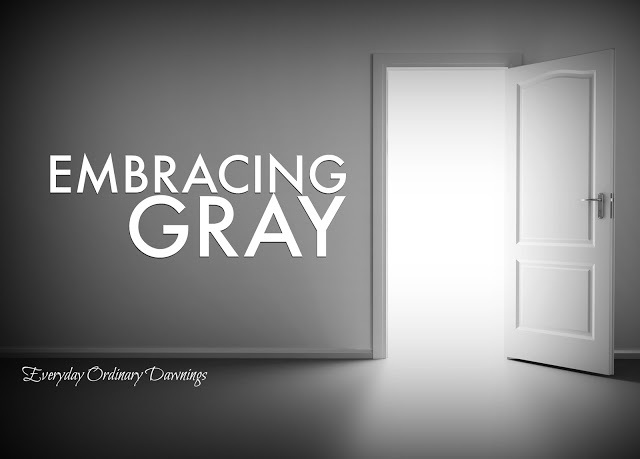 I love the embracing gray. I love how you intended different denominations. I have mainly attended non-denominational ( evangical/protestant) churches my whole life. I long for hyms and sacraments.. This is so beautiful. This line was one of my favorites: "May we never stop folding gently into all the ways to live into the freedom of Christ." Long live the process, which lasts so much longer than we ever thought, but which is so, so good. Thanks so much for linking up!